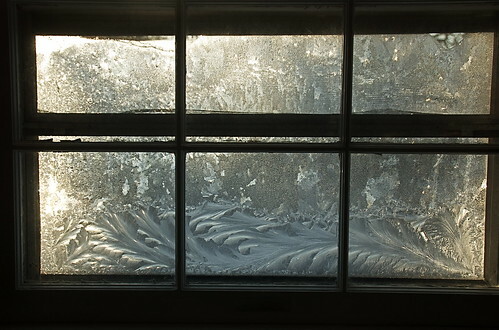 I can’t imagine all that ice on our windows can be a good thing, but it sure is beautiful, eh? 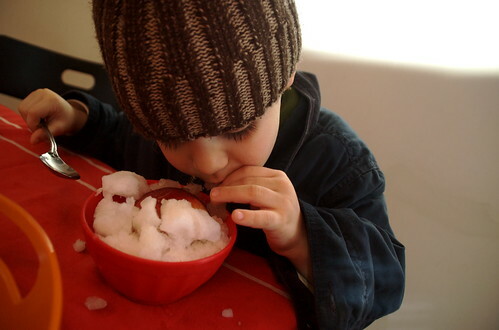 The kids begged and pleaded to make snow cones from the fresh powder that covered the landscape yesterday morning. I hemmed & hawed … we had no syrups in the house & wasn’t snow bad for you? Well, it probably would have been bad for me in New York City where I grew up, but out here? It was pristine. So I handed them a squeeze bottle of honey & told them to have at. They were thrilled, and I had an extra few minutes of quiet to putter about the house. Tor was given the most awesomnest gift ever today — a snowman kit! One of the parents at Tor’s school made this set, and I need to meet them to tell them how much they rock. The snow was too powdery today to make a snowman so I stuck the pieces in a big drift to give you an idea of what it looks like. 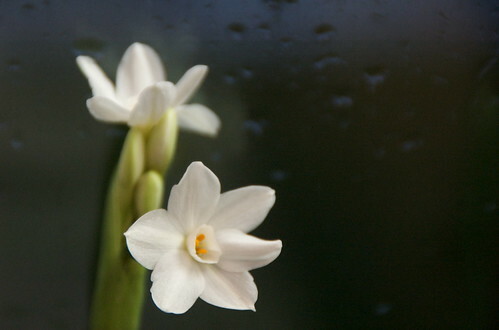 After I took this picture, Tor went back outside to move the flower from “her” hair into “his” hand. Turns out our snow-drift is a he. 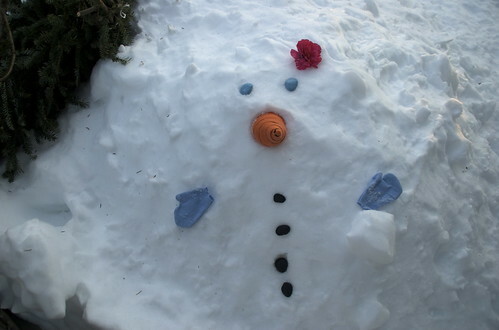 Each piece is hot-glued to golf tees that you just poke into the snow. The gloves are sewn fabric, and the carrot nose is a sewn and stuffed felt cone. The eyes and buttons are all Sculpy clay. So simple. So perfect! 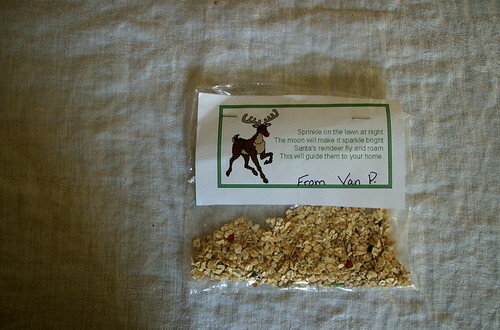 Bjørn’s classmate handed out the sweetest Christmas treat for his buddies at school yesterday — reindeer food! Very simply, it’s oatmeal (uncooked!) with some glitter sprinkled in for the kids to scatter on their yards as a thank you to Santa’s reindeer for all their hard work. I love this, and plan to send the kids out to dispense it when it’s time for us to bring all the presents out of hiding (between dinner & before the dancing around the tress dancing commences).